Metron Front Hydration System (V17). Included Vision Drop Bottle System and Extension Mount. CFD refined integrated bottle with bento box and computer mount. Articulated straw mount to allow precise positioning and unobtrusively fold-away. Patented and removable labyrinth water fill-spout for rapid refills without splashing. Standard and Garmin computer lid options. Detachable bento box for ease of cleaning and multiple configurations. Forward computer mount with easy line-of-sight. The item "Vision Metron Refined integrated bottle Front Hydration System V17 Black" is in sale since Saturday, November 11, 2017. 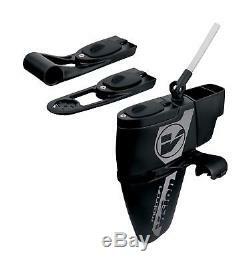 This item is in the category "Sporting Goods\Cycling\Bike Accessories\Water Bottles & Cages". The seller is "laxzo" and is located in London. This item can be shipped worldwide.